GASTRONOMY by Joy: Thai Me Up and Fil Me Up! The first thing that really drew me here when our van entered the premise was how the place have been rainbow-ed up. The play of colors gave a certain character to the place. Though I can not truly say if this is Kagay-anon in nature, but you can predict this place to be cheery. It was a Tuesday night, you don't expect a restaurant in CDO to be filled up in that kind of day, but surprisingly they are almost full, considering the place is really enormous. Even the garden seating are all occupied. And I'm thinking, what more if it's a weekend? Well if you think this is the only restaurant CDO have, then let me tell you, you are WRONG! 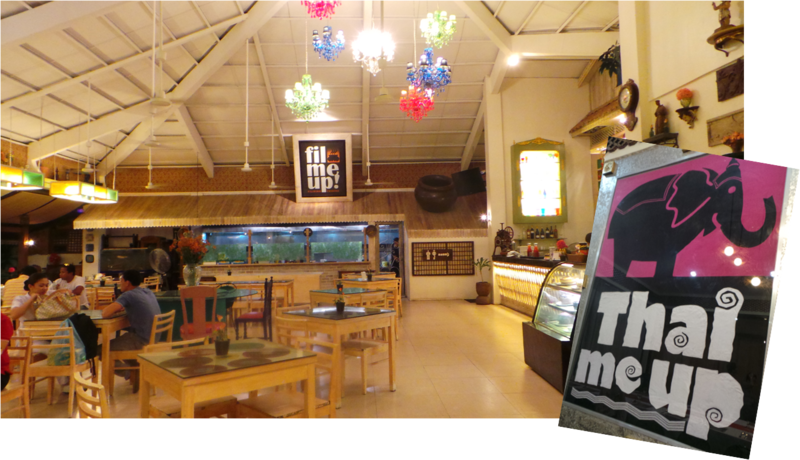 CDO is a promising haven for food-spotters and a very recommendable site for your next food-trip. Do you think there is something missing in this photo? Yes! You! Look how whimsically designed every piece are. I used to sew with this when I was in n high school. Making a table out of an old grandma's sewing machine is so clever. Displaying intricately designed antique plates in this manner is very Italian, by the way. No two tables are the same. They are graced with something kooky. Like this table, which has decades-old comic books. Others would have old school song hits or song books, while others would have really old posters and photos of celebs. Wait till you see their washrooms. But let me take you to a tour of our sumptuous dinner. One of the best-seller, it is a bit sweet with a zest on the side. A somehow controversial dish (not that it sound a bit playful), this is a cross of Tinola and Gising-gising but with gata (coconut milk). I love this! For simple and quick fix me uppers, this sotanghon pancit with chicken strips are nice. I like that they didn't use soy sauce to season this dish. While in Camiguin, I have tried two different versions of Kinilaw. One with gata and another with just lime and fiddle-head ferns but spicy. Sinuglaw is CDO's Kinilaw, which differs in that it has vinegar and gata, and the magic ingredient -pineapples. I love Kinilaw, specially if the fish used is as fresh as what Camiguin and CDO uses, which is bountiful in Northern Mindanao. Time for some taste of Thai, though, with a Filipino twist. I also liked this version of Samosa. It is not oily. With the use of Galunggong meat with Thai herbs infused into it, it amped up our usual fix for Lumpiang Shanghai. They do have an ample dessert choice with cakes and pastries, etc. But what is Filipino feast without Fruit Salad? Most of the recipes they have under Fil Me Up! are inherited from their moms' moms. The ones under Thai Me Up are from their chef's list of being educated in Thailand. Did I mention that they are serving two menus at the place? So if you ever come to a chance that the group is looking forward to a different dinner (maybe Thai) while the others would just want simply Filipino dishes, then this is the place. For sure, on my next visit to CDO, in time for our family's next food escapade, this will be on our list! If you wish to read about my Camiguin tour, kindly click HERE. If you wish to read about my Cagayan de Oro tour, kindly click HERE. My Food Trip Friday entry for this month!